Luhrmann's wife, Catherine Martin, did the costume designing for Gatsby. And of course she had a little bit of help from Muccia Prada and Tiffany & Co. The clothes were every bit as decadent as the decade, with dropped waists, fringe and bead embellishments, and dripping diamonds. 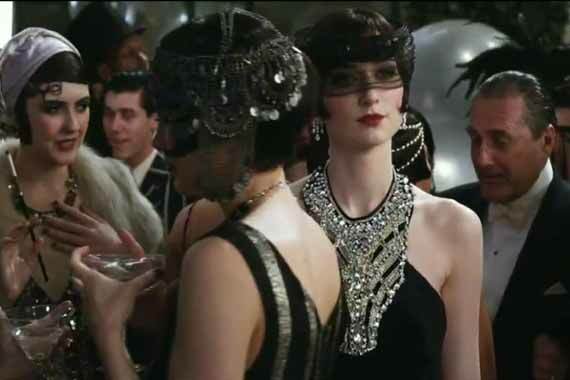 Daisy was of course the fashion star, in one scene donning a purple fur and feather stole over a diamond-encrusted gown that seemed to dazzle everyone in the room, not just the mysterious Jay Gatsby. Even the men looked exceptionally handsome in crisp suits and charming sweaters. The clothes that each character wore were really reflections of their personality: Nick wore the tweed suits and polished cardigans of a young Wall Street man; Myrtle's clothing (while not very accurate to the time period) made very clear her overt sexuality; Jay's bold suits are eye-catching and expensive but lack the classy subtlety of the old money families he will never be a part of. The movie was quite beautiful and visually stunning. Even my friends who aren't very interested in costumes or fashion raved about the clothing. As a fan of art deco and the 1920s style, I certainly thought Gatsby was great.